[Editor's Note: The article below, delightfully rendered by DNA Info's Mark Konkol, tells one aspect of the recent local school council elections story nicely. The LSC rules established a quarter century ago by the first corporate "school reform" law (passed in 1988) discriminate against anyone who works for the Chicago Board of Education. Basically, those of us who are parents as well as teachers cannot run for or serve on local school councils as parents, even though we are parents. Chicago Teachers Union field rep Joey McDermott is on leave from his teaching position at Crane High School. Because of that fact, the Board's Law Department has ruled that McDermott is ineligible to be elected to the local school council at Sayre Language Academy. Meanwhile, as DNA Info reports, charter school teachers and other staff can be elected to LSCs because officially a charter school teacher does not "work" for CPS.And so, for nearly a quarter century, I have been among those discriminated against by law because I lived in Chicago, worked as a CPS teacher (before being blacklisted by Paul Vallas 14 years ago), and had my kids in a Chicago public school. The discrimination began when my son Danny (now 25 years old and living and working in the Bay Area as a STEM person) was a student at Beaubien Gifted and then Whitney Young High School. I was ineligible to run for LSC "parent" rep at either of the schools because I was also a teacher. (Today, because I am retired, I would be eligible, but my wife Sharon, who teaches at Steinmetz, is not eligible to be a "parent" at O.A. Thorp despite the fact that our two sons (Sam, in seventh grade; and Josh, in third grade) go there). That union-busting discrimination was built into the 1988 so-called "reform" law by the so-called "reformers" who sat in Michael Madigan's office and wrote the law, line by line. That discrimination, aimed precisely at the Chicago Teachers Union and those of us who are or were union teachers, remains in that so-called "democratic" law to this day. There is more. The LSC law was also an anti-union law by virtue of the fact that it removed us from the ranks of "parents" and also subordinated us by a margin of three to one to the remaining "real parents" who were eligible. When anyone quotes something pious about local school councils I remind them that the LSCs from their beginning were hatched by a bunch of activists who were anti Chicago Teachers Union, and until the number of teachers on the LSCs equalled the number of parents and teachers who are also parents were eligible to be "parents" for LSC purposes, I wouldn't be joining the cheerleaders who sanctimoniously prattle about the importance of "democracy" -- LSC style. Had the LSCs been established to do democracy back in 1988, those of us who taught in CPS and also had our kids in CPS would have been eligible -- democratically -- to serve on the LSCs where our kids go to school. Now, in 2014, the hypocrisy of LSC law is even more stark, as the article below notes, because charter school teachers and staff can be elected to LSCs in 2014 -- but real public school parents still can't! George N Schmidt, Editor, Substance]. GALEWOOD � Joey McDermott fights. 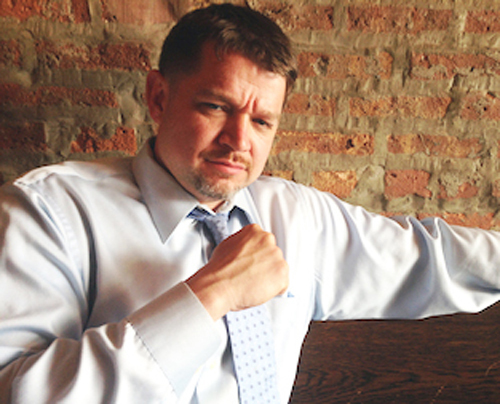 In fact, on the right day you can catch him at the Mercy Home's boxing gym sparring with 4th Ward Ald. Will Burns. At work, the Chicago Teachers Union field rep's best days are the ones that involve verbal battles with principals over teachers' rights. And nothing gets his Irish up more than Mayor Rahm Emanuel's position on funding public education, charter schools and school closings, among other things. Maybe you remember McDermott from CNN's "Chicagoland." So, it was no surprise when McDermott told me he plans to go down swinging over a Chicago Public Schools decision that declared him ineligible to the term he was elected to serve on the Local School Council at his daughter's school. The CPS Law Department sent McDermott a letter explaining that even though he has been on leave since 2010 while working for the CTU, the former Crane High School teacher remains employed by the Board of Education. And according to a 1988 state law, that status makes him ineligible to serve on the LSC at Sayre Elementary in Galewood unless he resigns as a teacher by June 30, CPS lawyers told him in emails. The same rules don't apply to teachers at city charter schools, because charter school teachers are not Chicago Public Schools employees. While McDermott doesn't get paid or receive benefits from CPS, his employment status does preserve his tenure, sick days and pension benefits until he either returns to the classroom or quits. "I seriously contemplated resigning my leave of absence from the board until I found out I wouldn't [get] pension years of credit,� he said. The fact that McDermott appears to be on the wrong side of a state law has only strengthened his resolve to fight the decision. McDermott repeatedly asked for a hearing to argue against the CPS Law Department's interpretation of the 26-year-old law that he says wasn't meant to stop a parent in his situation from serving on an LSC. "This decision is politically motivated and indicative of the suppression of dissension within the Chicago Public Schools. "This decision by the Board is the antithesis of the spirit of the 1998 school reform act,� he said. McDermott said he believes CPS is trying to block him from a seat on the Local School Council at the request of Sayre leadership, with which he's had a few disagreements over the years. Sayre Principal Suzana Ustabecir didn't return calls seeking comment. And CPS spokesman Joel Hood said McDermott didn't properly challenge the ruling in time to get a hearing. Retired Sen. Arthur Berman, who was the principal Democratic sponsor of the 1988 Chicago school reform legislation, said McDermott's dispute, along with the growing number of charter schools in Chicago, are good reasons for state lawmakers to take another look at the law. "The whole purpose of Local School Councils was to give broad representation to community groups. That's why students, community people, principals and teachers are on there,� Berman said. "What you have here [with McDermott] is a unique employment situation that we didn't consider. I don't think we ever thought about what would happen with [a teacher on leave]. I think a judge would have to interpret the intention of the wording in the statute. McDermott isn't happy about that. McDermott said he plans to circulate a petition, lobby state lawmakers and demand a new LSC election.